1 Cook sushi rice according to package directions. Stir in vinegar and spread out on baking pan to cool. 2 Place 1 sheet nori on bamboo mat or sheet of plastic wrap. Press a thin layer of cooled rice onto nori leaving a 1/2-in. border on top and bottom. 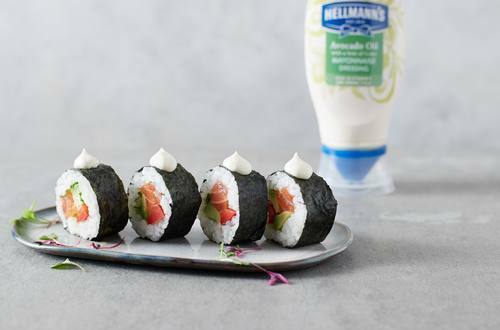 Combine Hellmann's® or Best Foods® Avocado Oil with a hint of Lime Mayonnaise Dressing with wasabi and spread a thin layer on top of rice. 3 Arrange some of the salmon and avocado on top leaving a 1-in. border on the bottom edge. Slightly wet top of edge of nori. Roll tightly from bottom to top, using mat to help. Cut into 8 pieces. Repeat to make 6 rolls. Serve , if desired, dolloped with extra Mayonnaise Dressing and serve, if desired, with soy sauce for dipping.